Conor McGregor may have tapped out in the fourth round of his UFC lightweight title fight with Khabib Nurmagomedov – but he was lucky not to be disqualified in the very first round. On Saturday night, the two men finally got down to business in the Octagon with Nurmagomedov dominating from the first round onward, eventually securing victory via neck crank in the fourth. He then vaulted over the walls of the Octagon to attack McGregor’s cornermen, ensuring that all of the following day’s headlines were dominated by the fight after the fight. And yet it could have been a whole lot worse for McGregor. In the first round of the fight, Nurmagomedov secured an early takedown to take the fight to the mat. 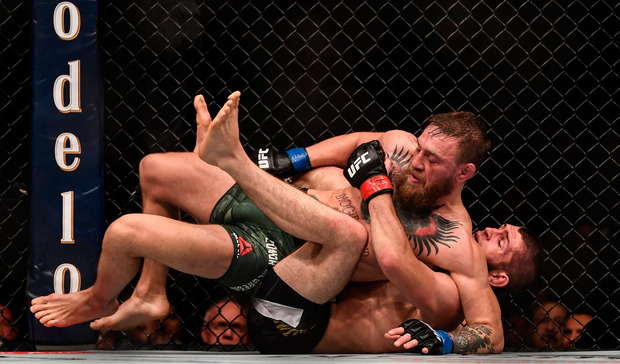 And when pressed up against the cage around one minute into the fight, with Nurmagomedov looking for an early submission, McGregor threw several illegal strikes which could have seen him disqualified. McGregor rains down 12-6 elbows on the back of Nurmagomedov’s head, with the attack only stopping after the defending champion brought the illegal strikes to the referee’s attention. 12-6 elbow strikes – also known as "twelve to six elbows" or "downward elbow strikes" – are illegal under the Unified Rules of Mixed Martial Arts, defined as “striking downwards using the point of the elbow”. Such bans were justified for medical and safety reasons, due to the possibility of serious injuries to opponents that could result from their use. UFC fighters can therefore be immediately disqualified for throwing them. Light-heavyweight legend Jon Jones is arguably the most profile fighter to fall victim of this rule, with his 2009 bout with Matt Hamill being stopped when the referee judged Jones to have used illegal elbows. Jones was immediately disqualified and the defeat was the only blemish on his otherwise flawless professional record, until his most recent victory over Daniel Cormier at UFC 214 was overturned when he tested positive for turinabol.